A while back, Firefox got an option to only load tabs when they are clicked, which makes Firefox a lot faster if you have many open tabs. But this was only implemented for regular tabs and didn't work for app tabs (pinned tabs), until Firefox 12 which got an about:config option to load app tabs on demand too. in the search box and double click it (or right click it and select "Toggle") so it's value becomes "true". This won't work unless you also set regular tabs to load on demand so in the Firefox Preferences, on the "Tabs" tab, make sure "Don't load tabs until selected" is checked. 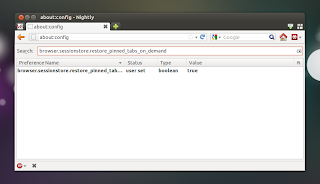 Now restart Firefox and the app tabs should only load when selected, just like regular tabs.